I know… the careless intermingling of DC and Marvel icons is going to send some of you into conniptions. We don’t know what flavor the cake is. Via People Change Feelings Fade, who likes cake, and likes pictures of cake, but not mentioning where she found pictures of cake. 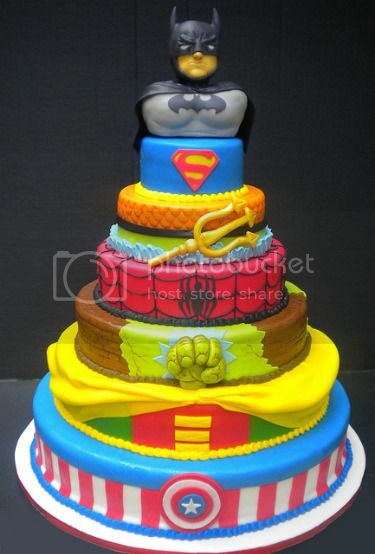 This cake is, dare I say it?, HEROIC! Thanks for sharing. Congrats to the designer & photographer! Hello it’s me the baker :) Thanks for posting my cake pic (I made the Mario ,Princess Peach and Yoshi cake also that you posted from Threadcakes). I know that I put both DC and Marvel heroes on there but it was at the request of the birthday boy, those are his fav’s and you can’t say no to a cute kid! Marble w/ butter cream, Dark Chocolate w/ Toffee Butter Cream, Dark Chocolate w/ chocolate ganache and toffee filling and White w/ raspberry filling. WOAH!!!! that is one cool cake!!! How long did it take to make that??? WTF why did I not get told of this awesomeness sooner? This was our son’s 2nd birthday cake!